TX Text Control 15.1 is out Now! After months of planning, designing, and implementing along with weeks of testing and writing documentation, we finally released TX Text Control 15.1. Even though the major version number did not change (15), 15.1 is a major release. It contains many new and helpful features. Apart from that, it contains many other new features and improvements in various areas. I will introduce most of these new features in the upcoming days and weeks in detail by presenting samples or articles about them. But today I want to comment on two frequently asked questions, we did not mention on the update micro-site. Is Windows 7 supported by TX Text Control? Short: Yes. Longer: We intensively tested all editions of TX Text Control 15.1 with Windows 7. We started with the first early beta versions of Windows 7 and tested the final RCs and finals as well. Results: TX Text Control 15.1 works without any known issues on Windows 7. Will TX Text Control 15.1 work with Visual Studio 2010? Yes. 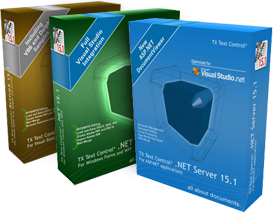 As a Microsoft Visual Studio Industry Partner, TX Text Control 15.1 has already been tested with Visual Studio 2010 and we were able to integrate TX Text Control smoothly into this new IDE version.